As the calendar turns to November and grass growth slows, it’s easy to lose sight of specific care that can be taken to ensure a lawn’s health through the winter and into the next growing season. 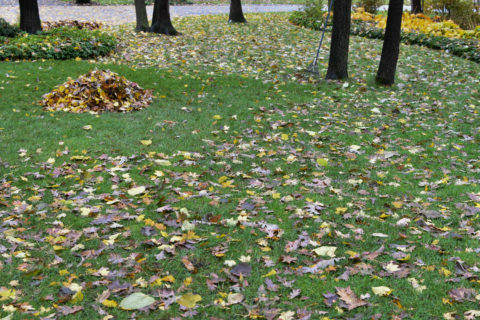 Leaves should be cleaned off of your lawn frequently. During the fall months, it’s important for grass to continue getting sunlight. To create richer soil, leaves can be swept into mulch or wooded areas around your yard where they will decompose. Any leaves left on the ground during the winter will form a damp carpet, trapping moisture and hiding grass from sunlight. Even when grass is dormant, it still needs appropriate light and moisture. As winter sets in, it’s important to adjust your mowing height. If grass is kept too long, it can fold over on itself leading to issues such as snow mold or fungus. Longer grass also tends to catch trash and other debris. A lawn should be around 2 ½” in length after the final cut of the season to guard against these problems. Since mower blades will be lower than usual, watch out for stumps, roots, water valves or other obstacles !! To survive through winter, grass stores up nutrients before entering dormancy. While fertilization during the season provides specific nutrients for growth, a winterizer treatment gives the lawn an extra boost of the nutrients which the grass will store for winter. Some of the winterizer will also sit in the soil through the winter ready for grass to use as the ground warms up in the spring. Lawns receiving a winterizer application are more likely to green up quickly in the spring. Mid to late November is the best application window for this treatment. Now you know several ways to protect your lawn before winter sets in! If you have any questions or would like to discuss a winterizer fertilization for your property, call us at 260-489-2500, contact us via our website at crownandblade.com, or simply reply to this post. May your lawn bring you joy!